He's a silly one, that husband. I guess he prefers his enchiladas/burritos filled with freetos, dorritos, oozing cheese, and 20 minutes later a side of I probably shouldn't have ate that like ever. Oh I love him. But definitely not after he eats those burritos. Speaking of love, the other day it was pouring rain outside and my kids took the longest naps they have ever taken, at the same time. 35 minutes friends...haha I kid, but seriously. Most days that's as long as their naps last. This nap was a two plus hour one and during that time I accomplished more than I usually do in a week (although I still didn't shower.) It was marvelous, I felt like superwoman. During that time I prepped and made dinner for that night so It would be ready to go come that afternoon. I believe they call that 'being prepared.' What a wonderful idea...I really should be prepared more often. 1. Pre-heat oven to 400 degrees. 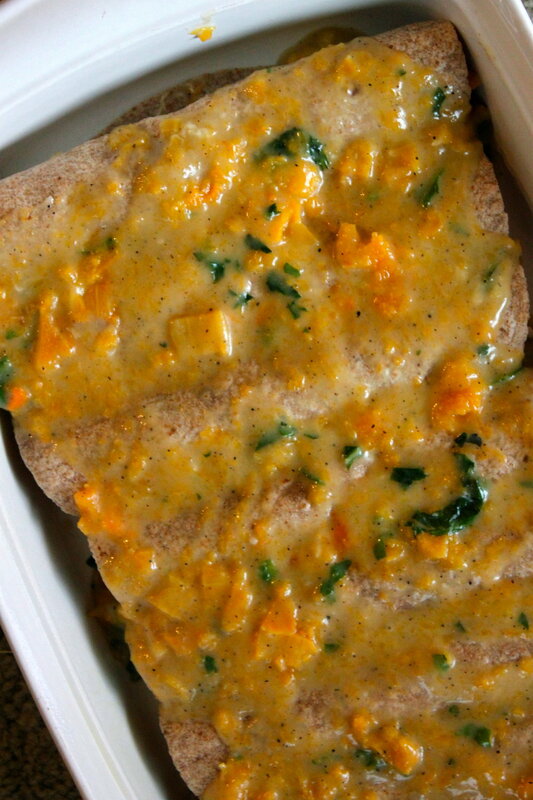 Add diced butternut squash onto a baking sheet covered with parchment paper. Toss with a little 1-2 TB. melted oil and sprinkle of salt and pepper. Roast in the oven for about 30 minutes, or until squash is tender. 2. Once done, turn oven temp down to 350 and keep cooked squash on baking sheet and divide amount in half. Using a fork, mash half of the squash the best you can. It doesn't have to be perfect or totally pureed, just a chunky mash. Leave the other half to set aside. 3. In a saucepan add the 2 TB. of coconut oil and let melt over medium heat. Whisk in flour until combined and continue whisking until the paste begins to bubble. Whisk in broth until combined. Bring mixture to a bubble, whisking every so often. Turn down the heat to low and stir in the mashed butternut squash. Toss in fresh herbs and season with salt and pepper. 4. Fill and roll your tortillas and place them in a baking dish. Top the enchiladas with the rest of the sauce and if desired sprinkle a little amount of cheese on top. Bake for about 20 or so minutes. 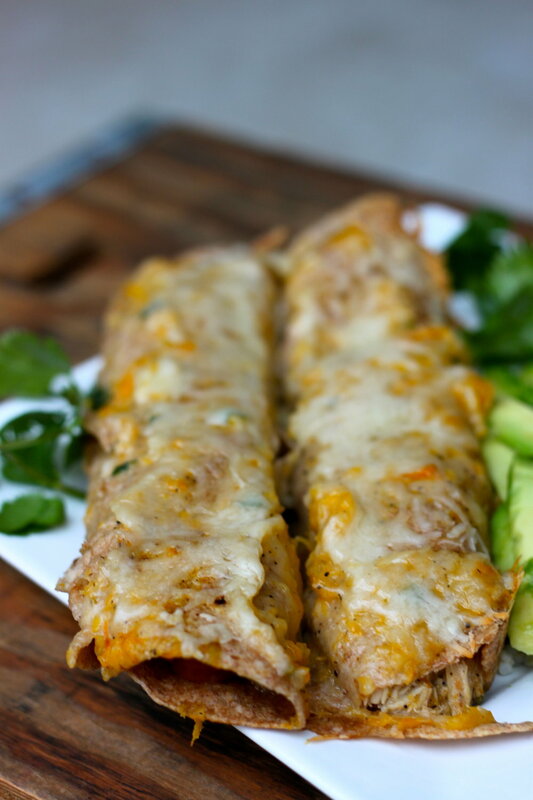 You know what pairs best with these enchiladas? Two energetic and happy kids whose bedtime went from 7:30 to 10:30 that night because they weren't tired..due to the naps. Come to think of it, who needs a two hour window to accomplish things anyway?